Outstanding Crochet: Unknown brand. Circle crochet top. Pattern. Unknown brand. Circle crochet top. Pattern. Hi Natalia, do you have the pattern for the crochet top from the first picture? Thanks! Hello, sorry, I don't. There is no pattern, it's from a catalog, I guess. Couldn't find something similar. Sorry, I don't have a pattern. Thank you! If you want a pattern to the top in this post, I don't have it, sorry. There is chart for the brown one(last picture). Click on the link. I'm looking for the pattern of the blue lacey pullover top, 3/4 sleeve. I'm looking to make something very similar to that to wear over a tank for riding on our bike; to help shade some of the sun. If you don't have the pattern, do you have anything similar you can suggest. Can knit also. Thanks! Love your post!!! Thank you! Somebody else asked me already about this one and I couldn't find anything. I guess I have to make it myself eventually. :) Sorry, I couldn't help. I'll try to look into that one more time. That's ok; thanks for getting back to me! I'll keep looking, this one was exactly what i'm looking for. OMG!!! Natalia, I am sooo sorry. I am just reading this and you posted it back in March. I started watching my grand baby and haven't been on the internet except for checking emails and shopping, much. Thanks for trying; not really what i'm looking for. I'm making one right now I got the pattern in a book at a knitting store near my house. Very similar to the picture of the one on your website that I really liked. Don't worry. I miss comments as well. Glad you were able to find one! Natalia, the link not the same. From Argentina. Regards. 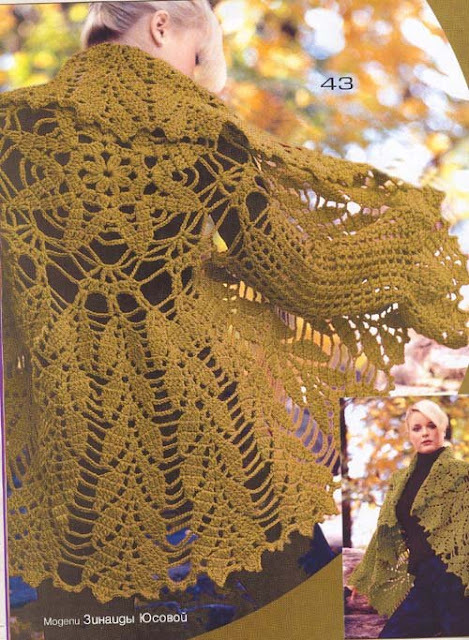 From what I see the height of vertical stitches is about the same as arcc length so if you make arcs: ch7 (7 chain stitches), it would be dtr 2 tog ( 2 double treble crochet together (yarn over 3 times for each)) in the ch7 arc of previous row. You also can try to do ch9 arcs and trtr 2 tog (yarn over 4 times). To increase, make trtr 2 tog in trtr 2 tog of previous row - between arcs. You have to count how many you need to make the circle flat. me puede dar el patron de saco azul o cuanto tengo q pagar por q ud señora natalia kononova me dijo q tenia q pagarle por el patron ...primera ves q veo q cobran por un patron ..